NMR Buddhist Temple – Synivate, Inc. The NMR Buddhist temple is located in Raynham, MA and is the largest Thai Buddhist temple in the world outside of Thailand. 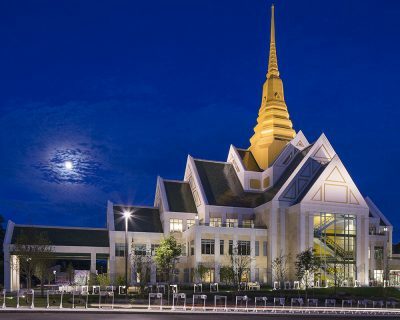 The entire facility is over 110,000 square feet, comprised of multiple temples, meditation rooms, residence halls for the monks, visitor residence halls, a courtyard, museum-library and multipurpose rooms. The NMR Buddhist temple opened to the public in June of 2014. During initial consultations with the directors we realized the immense need for reliable WiFi throughout the entire facility including the outside gathering areas, multipurpose spaces, conference rooms, residence halls and function rooms. The biggest challenge was designing a solution that provided carrier-grade performance specifically during large events where thousands of people would gather at the NMR Buddhist temple. With most WiFi solutions, client density at this scale is a major issue. Also, we were tasked with hiding the access points throughout the facility. Typically, access points are mounted to the ceiling grid in commercial spaces. This was not a workable solution with the ceiling design in the facility. We utilized Cisco Meraki technologies to build a performance-driven and resilient solution to provide WiFi throughout the 110,000 square foot facility. We deployed a carrier-grade MX series firewall and load balancer to negotiate redundant low-latency internet connections from a local ISP. 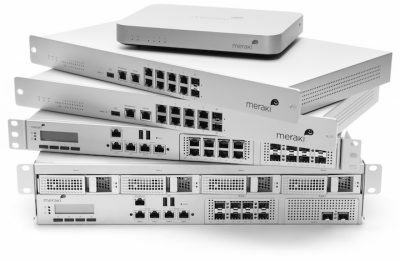 We utilized Cisco Meraki MR series wireless access points throughout the facility to ensure complete coverage and balance client density, resulting in high-performance throughput to all wireless clients. Utilizing Cisco Meraki cloud-controlled technology, we were able to ensure a high level of security throughout the network by isolating individual wireless clients and preventing against wireless threats with wireless intrusion prevention.